According to the UNEP, an estimated 1 billion people are exposed to outdoor air pollution annually, out of which roughly 1 million die premature deaths. To improve air quality and decrease urban congestion, cities across the world are getting creative: last Tuesday (September 22nd), citizens danced, walked and biked in the streets for international car-free day. Organized informally in Europe during the early 90s, car-free day was later established as a Europe-wide initiative by the European Commission in 2000. Since then, more than a thousand European cities have joined the movement, with hundreds more outside the continent joining on. This past Tuesday, cities like Beijing, New Delhi, Mexico City, and Rio de Janeiro took a breath of fresh air as they closed down roads to motorized traffic, giving citizens the opportunity to walk and bike to work free of unsafe traffic congestion. In Europe, this year’s car-free day was the concluding event of a week-long festival celebrating innovative urban transportation—European Mobility Week—which took place between September 16 – 22. 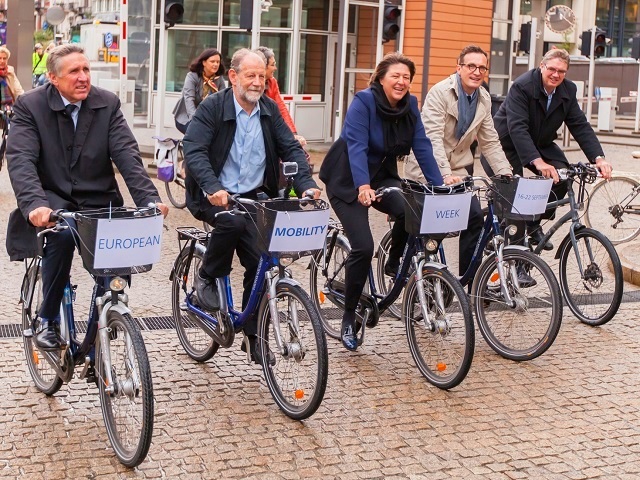 This year, 1,826 towns and cities joined in on Mobility Week, including many outside of Europe. With the motto “Choose. Change. Combine,” these cities put a spotlight on multimodality and encouraged people to #dotherightmix. Austria led in numbers with 457 towns participating, while Spain came in second with an impressive 365, and Hungary in third with 182 municipalities on board. The level of commitment and celebration varied among the cities. Besides organizing car-free days, some towns launched awareness-raising campaigns and led week-long activities to show the benefits of low-carbon transportation. Marseille in southern France, for example, held round table discussions on topics such as the link between sustainable transport and employment. The Czech town of Brno organized a “Safe at playground, safe on road” event, aiming to educate elementary school students on street safety and another called “Healthy movement for all”—which encouraged families to try untraditional forms of transportation and engage in athletic activities. Some cities used the occasion to install permanent measures, including: extended bike lanes, enlarged pedestrian streets, improved public transport accessibility and modified school travel plans. Nottingham, for instance, launched their online car-pooling and car-sharing schemes. In some places Mobility Week coincided with or preceded other sustainability-themed events, such as the aptly named “Save As. Sustainability Day” in Budapest taking place today (September 25). While the long-term impact of these events is tricky to measure, public opinion has been overwhelmingly positive. Under #mobilityweek, hundreds tweeted their photos of serene urban landscapes void of cars and filled with smiling bikers, kids getting creative with their chalk art on empty parking spots, and local political leaders sending video messages encouraging people to make a long-term commitment to cleaner, more dynamic and healthy cities. Car-free day extends far beyond Europe’s borders. Cities like Bogota, Moscow, Bangkok, and Izmir have dedicated entire days to being car-free. In China, 170 cities participated, including Beijing, where dozens of cyclists set out on a 3-day, 200-km journey to promote clean air and a healthy lifestyle. The bikers hoped to gather political momentum by making themselves more visible. However, not all cities had the same zeal and commitment for car-free day. Gurgaon, the financial district of New Delhi, for example, showed mixed results. Some estimates say that the event removed 10,000 cars from the roads and particulate matter concentrations were down by 21 percent. However, many people were not aware of the initiative, and others refused to give up their cars. Shuttle services were extended and the metro saw an increase in ridership, but the area needs better public transport and accessibility for the city to make such a large shift. While many new bike, bus and metro riders simply enjoyed a feeling of novelty on their September 22nd commute, there’s a much bigger picture to this event. The UNEP notes that “over 90 percent of air pollution in cities in developing countries are attributed to vehicle emissions brought about by a high number of older vehicles coupled with poor vehicle maintenance, inadequate infrastructure and low fuel quality.” We need to both reduce demand for mobility by smarter urban planning and clean our transportation modes by expanding public transportations services—such as making biking and walking around more attractive and safe, and by operating vehicles on renewable energy. We should use the momentum of these celebrations and events to start conversations and begin moving around in healthier and cleaner ways.